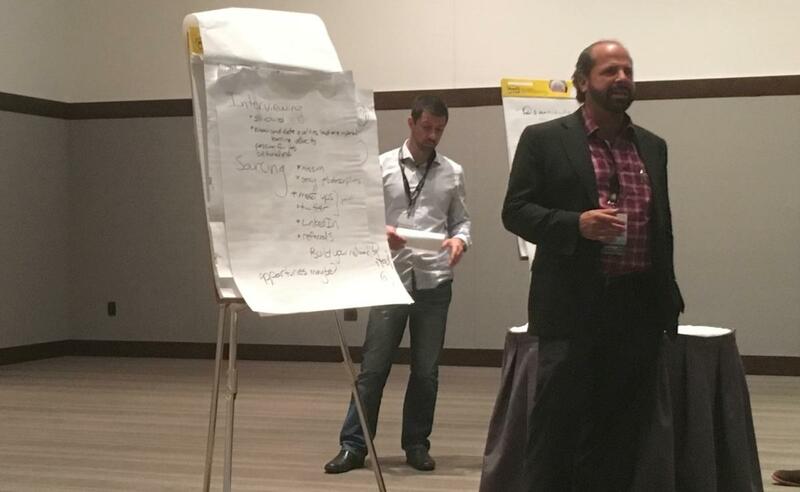 Paul Nickelsberg told a room full of attendees at this week's Innovation Unconference in Boston that he’s on the prowl for good tech people to add to his firm’s electronic product design team. “Just good?” inquired one of the session’s facilitators. Such is the state of hiring for talented techies these days at least in New England, where firms such as Nickelsberg’s are challenged to find fresh talent that is open to working in the ‘burbs rather than in Boston or bustling Cambridge (though he’s intrigued by the idea of opening a satellite office in a hip location). Speaking up about hiring challenges during one session at the conference earned Nickelsberg the duty of actually moderating a follow-up breakout session on the topic. As the Unconference's name implies, this is not your typical industry get-together. Attendees suggest and vote on session topics on the fly at this (interpersonal) networking-heavy confab orchestrated by the Massachusetts Technology Leadership Council (other sessions focused on topics such as microservices and the Internet of Things). The session on how to hire good tech people that Nickelsberg moderated proved to be a lively one, as participants chimed in on what it takes to hire people who fit into an employer’s culture and who have the technical chops to contribute. Nickelsberg kicked off the discussion by citing a scene from the movie The Social Network featuring a booze-fueled code-off, hoping that wasn’t the best way to try to find the sort of talent his team could use to grow. One MassTLC representative cited a hiring practice at another Massachusetts firm, MathWorks. She said the company is known for seeking out engineers who aren’t necessarily the entrepreneurial types from MIT or Harvard who are always looking to move on to their own startup. “They look for hires who will be loyal to them,” she said. A key to finding good talent is making sure your job description is precise, so that you don’t waste your time or prospects’ time, said one participant. “Your job description better reflect on what they’ll actually work on,” he said. Though one attendee noted a company that has no job descriptions, something that he said he liked, although others in the crowd were shaking their heads and rolling their eyes. “I do like that because I can’t focus on anything for too long…that’s why I like going to this Unconference,” he said, drawing a laugh. This all led to a discussion of the best techniques for interviewing job candidates. Some were sour on coding tests, emphasizing that job interviewees need to be treated like humans. Interviewers need to have real conversations with candidates, getting a feel for their “learning velocity,” their ability to pick up new things quickly. One popular suggestion, by an attendee named Bill, was that if you are going to put recruits through a coding test, having them write code on a whiteboard, that you might want to do the test with them. That would simulate more realistically how a company actually works, and perhaps uncover whether the candidate is good at communicating (not that programmers typically use whiteboards at all for coding). One attendee named Scott, a director of database architecture, admin and business intelligence, said his company has used an American Idol type of audition, where candidates found via LinkedIn and word of mouth are sent problems to solve, and are then invited to present their solutions to a panel of company employees with a say in the hiring. It’s a good way to see if candidates have street smarts, not just book smarts, as the panel grills them. How to find good young rock stars is a challenge for managers who are on the older side. One young woman in the crowd mentioned Twitter being used, with grabby hashtags, to sniff out fresh talent. Another participant mentioned his company’s website's use of a term along the lines of “opportunities maybe” attracted one ambitious 22-year-old who was hired after it became obvious her ambitions were in sync with those of the company. *Offering referral bonuses if you can afford such a program. *Reaching out to white paper authors, open source project leaders, etc. *Attending and getting involved at meetups and other networking-oriented events such as the Innovation Unconference (which kicked off with a speed-dating format to introduce attendees to each other).